The three materials above caught my eye during our class visit to Material Connexion. The first material is a multicolored wood. 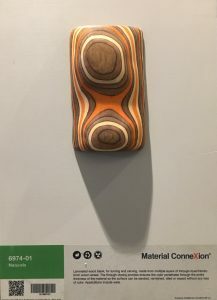 It is made out of “multiple layers of through dyed birch wood veneer” which allows it to be molded and carved in numerous ways without losing it’s color. It can be used in similar ways other wood is used, such as walls, tables, countertops, cabinets and other surfaces. This material caught my eye because I thought the different layers of colors were really beautiful and could be manipulated in interesting ways. I think this material would be amazing in interiors, where it could be used to replaced regular cabinets and tables and make them more of a statement piece. I also think its really interesting that the colors can be totally customized. 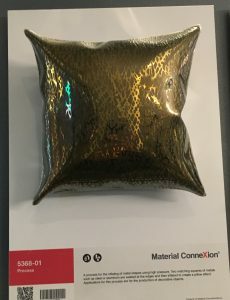 The second material is the pillow-shaped textured metal. 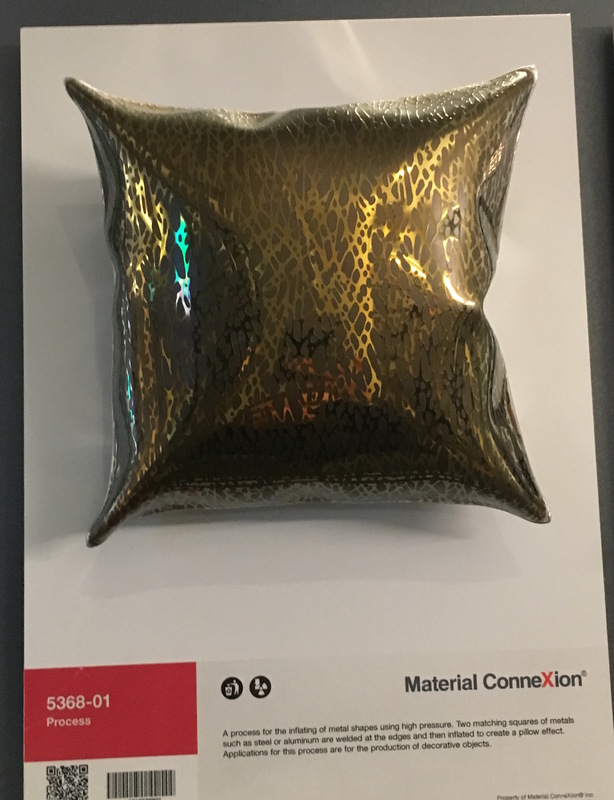 This material was so interesting to me because from afar it really looked like it would be soft to the touch and I was really surprised to find out that it was totally solid and hard and made out of metal. This piece was made out of steel/aluminum. It is made by fixing the two sheets of metal together by welding them, and then inflating them using high pressure. This material is used for decorative objects. 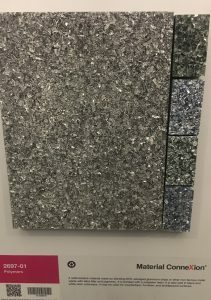 I think this material would be really interesting and unique in an interior as an installation/artwork piece. It could be something fixed to a wall in a home, or could even be enlarged to a huge scale somewhere more commercial to add an element of surprise in an interior. The third material is the resin surface with bits of metal inside. It is made of salvaged aluminum and other metals, pigments, fillers, and resin. The metal bits are bonded together with the resin to give the material a flat surface. Applications include countertops, furniture, and other surfaces. This material was interesting to me because the close one looks the more detailed it becomes. I think this material would make a beautiful countertop or surface in an interior because it would almost glimmer from afar and be an unexpected element up close. I also really like that it is made out of recycled metal and used in a beautiful way.